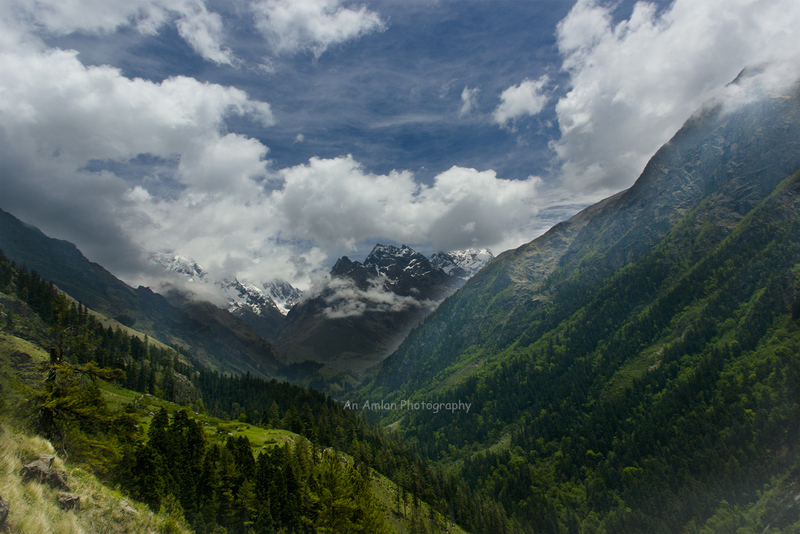 Har Ki Doon means the valley of Lord Shiva (a Hindu God). 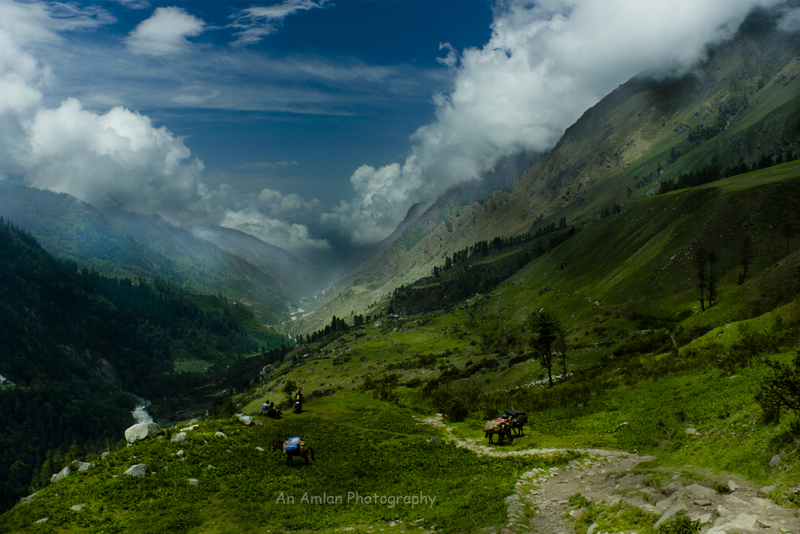 I am not sure whether god exists or not, but if he exists, Har Ki Doon valley must be one of his addresses. 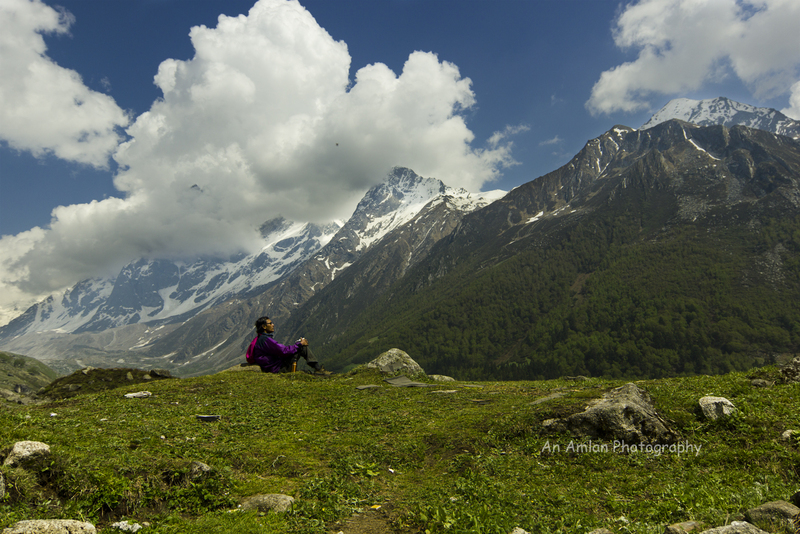 The trek is known for its grand vistas. 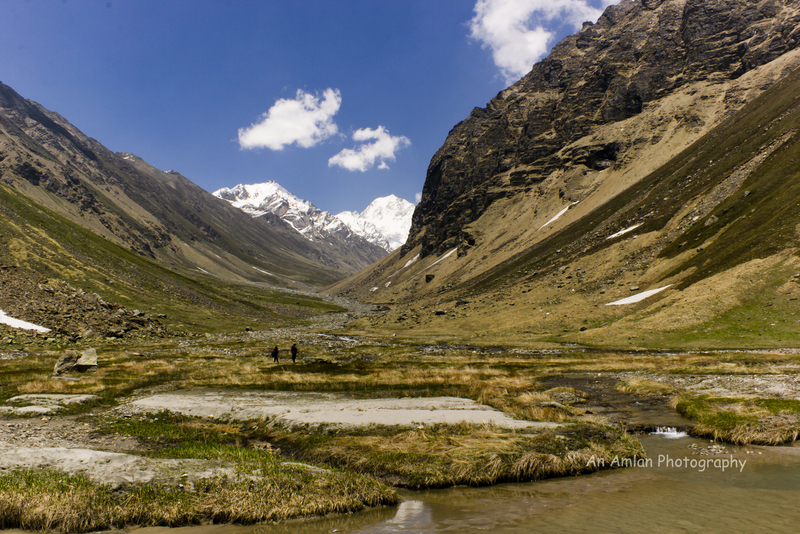 An easy trek, over major portion along river, up above are azure blue sky, backdrop is snow-capped mountains and foreground has lush greenery. 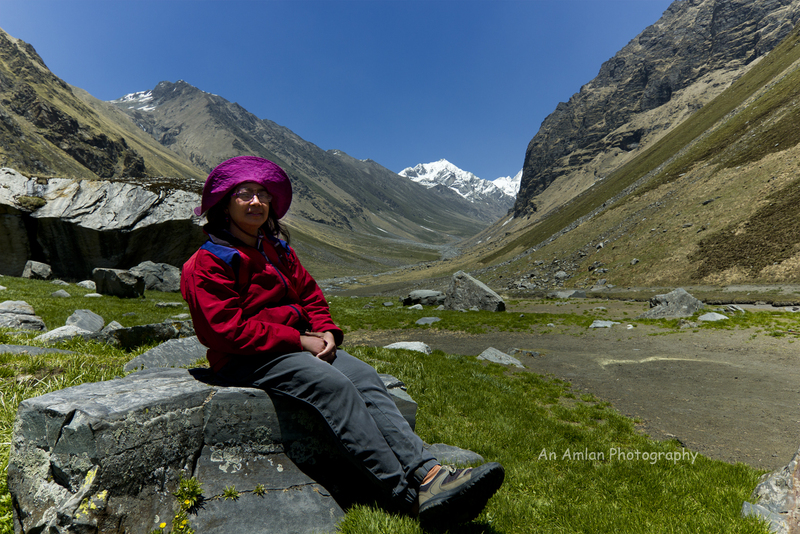 Though it is a popular winter trek, but we (my friend Avra, his wife Shipra and myself) decided to visit to Har Ki Doon in May, 2016. 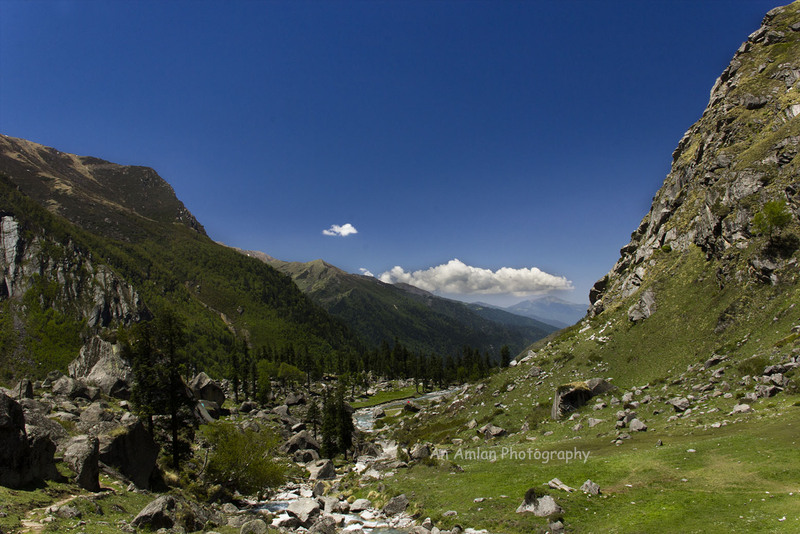 At the beginning of this travelogue, it is better to say you the location of Har Ki Doon valley. 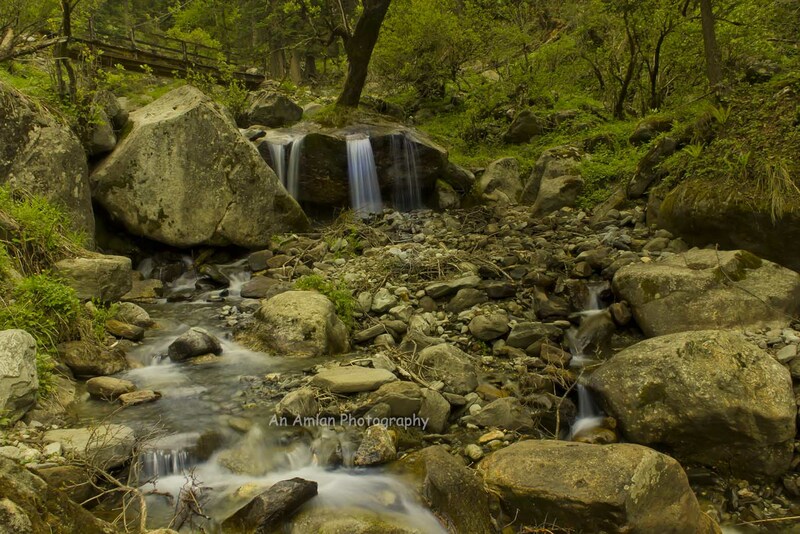 Located in the Tamasha valley of Western Garhwal, Har Ki Doon can only be reached by trekking from Taluka, a small village inside Govida Ballav Pant Wild Life Sanctuary. Which in turn is accessible by bus or car from Mussourie/ Dehradun. 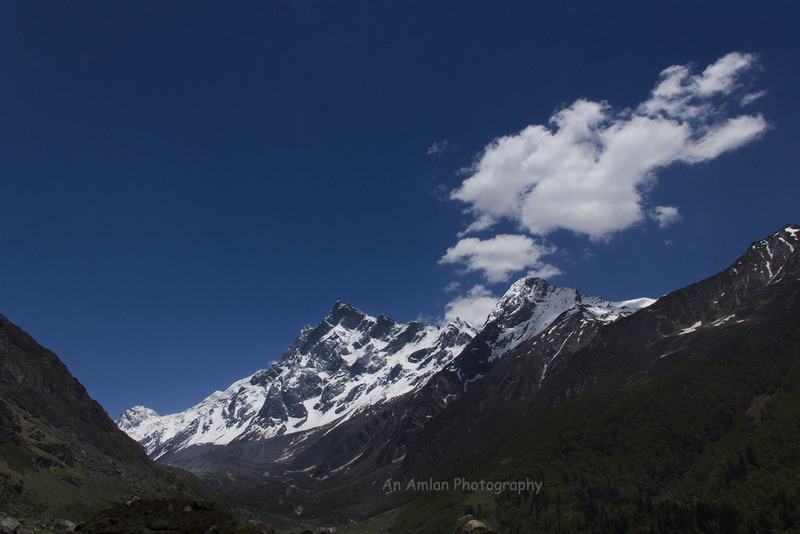 Har Ki Doon is the last shelter before crossing Borasu Pass to reach Kinnuar Himalaya. Though several ways are there to go to Dehradun or Mussourie but the best one is to get a direct train for Haridwar/ Dehradun from anywhere across India. At the beginning, we came across a hurdle. It was a last-minute decision to go to Har Ki Doon. Moreover, it was the last week of May – just in the middle of summer vacation. Most of the pilgrimage tour is used to get conducted in this time. Thus, the demand of the train ticket gets sky high. 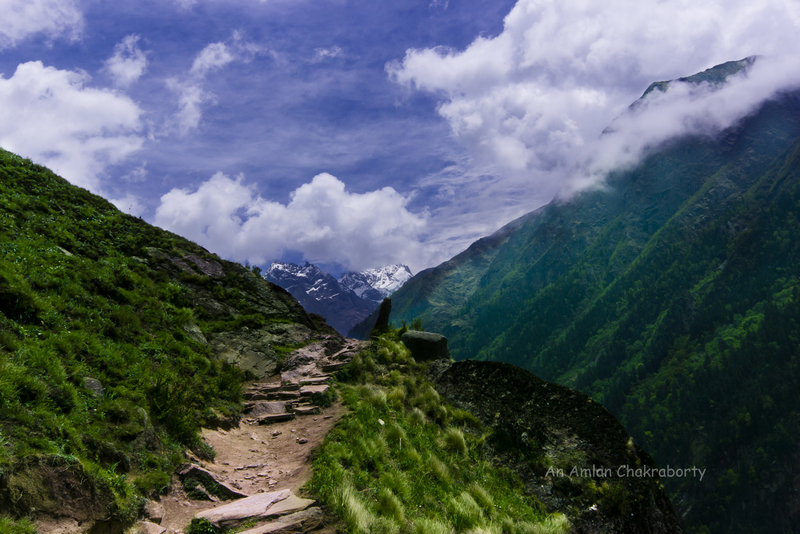 We are from Kolkata, where most of the people plan to visit to Uttarakhand to enjoy the summer vacation. After a lot of research in IRCTC site, we planned to go to Delhi by train and then getting a bus for Dehradun. 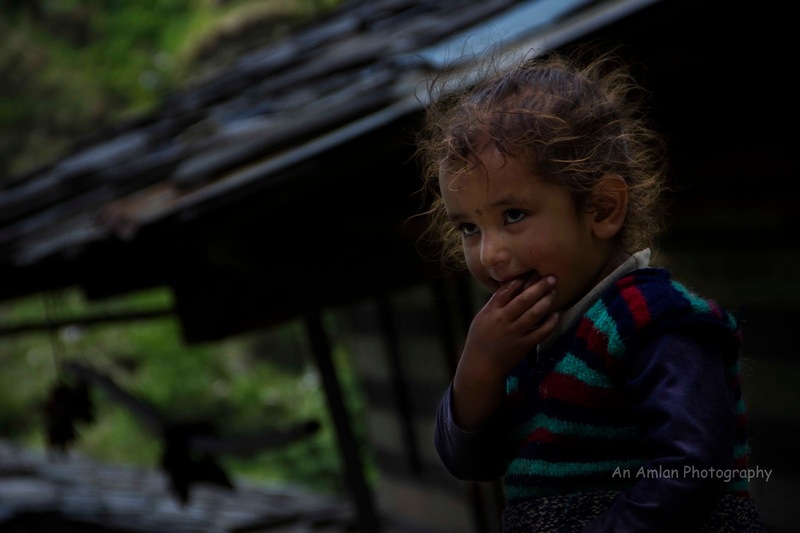 The second issue that we faced was the booking of trekkers’ hut in trek routes. Online booking was not available for Uttarakhand Tourism and its Kolkata office is located out of our day to day orbits. Somehow, Shipra Di, the engine of our team managed to do it. At the end our D-Day came. We boarded at Duronto Express from Sealdah and reached at Delhi on next morning. There was no such story in train except one issue that instead of chicken continental, we were served plain chicken curry. From Delhi, we availed a bus and reached at Dehradun within 6 hours. We did not book any hotel at Dehradun but it did not create any issue for night-shelter as there are lots of Hotels in Dehradun. Personal car was the only option for us. Those who have travelled to Uttarakhand are aware of this pain. The pain is getting a car in budget which is next to impossible. Although in eastern or central Garhwal, shared cars are available up to Rudraprayag or even sometimes till Ukhimath, but in Western Garhwal no shared service is available after Mussoorie. With having no alternatives, we had to hire a car for Sankhri from Dehradun Bus Stand. Obviously, the cab driver asked for twice as he won’t get any passenger during his return from Sankhri. We bargained a lot and at last both of the team agreed with 1.7 times fare. Obviously, the car journey was a great experience with the breath-taking view of Garhwal Himalaya. Moreover, the condition of road was also okay. Suddenly my stomach notified its desire for food. Avra da and Shipra di were in same page with me. When we asked our driver to stop in some restaurant for lunch, he suggested to wait for 20 minutes as we were very near to Purola. We would get much options there. He parked the car in front of a dhaba (food joint) where we ordered Alu ka Parantha with pickle. 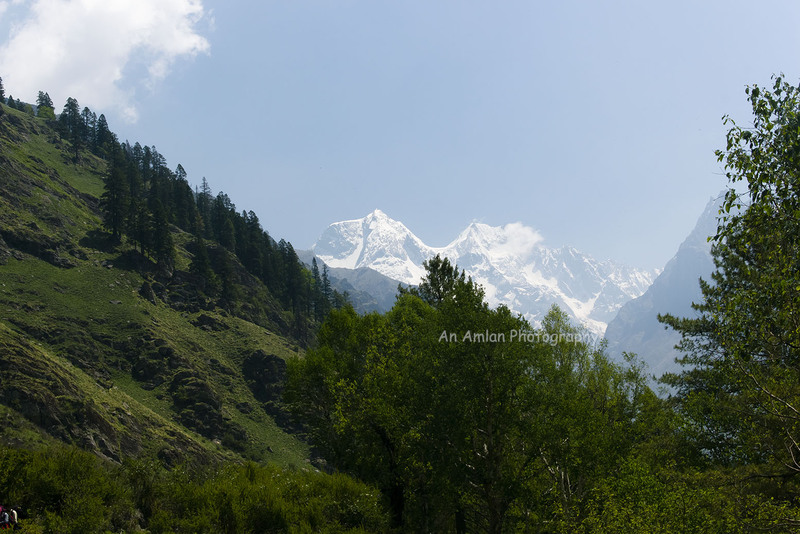 Looking at the faraway snow peaks of Garhwal I was silently reciting the great poem of John Keates – “To one who has been long in city pent”. I might fell asleep. Suddenly a cold air forced me to wake up, I found our car was running through a dense forest. Initially I got surprised with this Rip Van Winckle situation, but since the geography of this place was known to me, I understood that the Govind Ballav Pant Wild Life Sanctuary had been started. Driving at a certain distance, we reached at the check post of Netwar. We took permission of next seven days from Netwar Check Post by displaying our identity proof. At around 5PM we arrived at Sankhri. It was raining outside. We got shelter in a dhaba and waited for the next shared jeep for to come. It was an hour long wait. Finally, around 6PM we managed to get seat in a shared Jeep. The journey from Sankhri to Taluka is through the forest of Pine, Far, Oak. Lush greenery of the forest was a treat to eyes. Around 5PM we reached at Talkua and got boarded in GMVN Trekkers’ Hut that we booked from Kolkata. 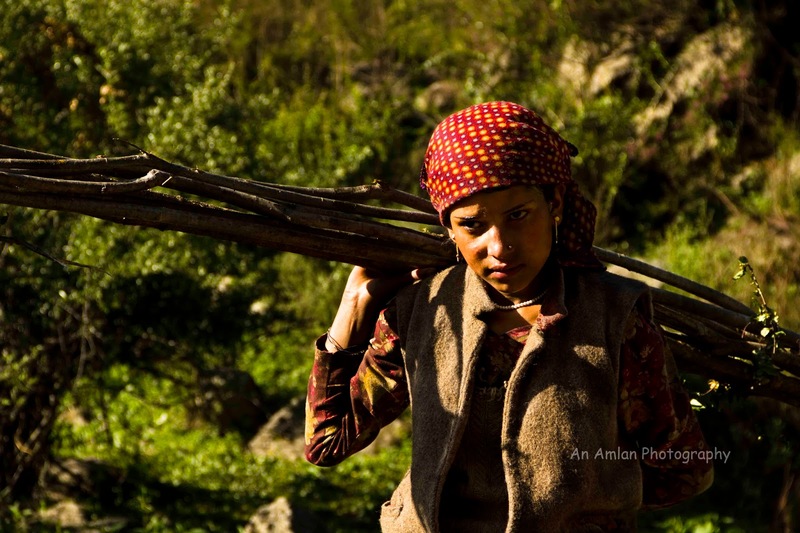 The first thing in our to do list was to get porters from Taluka. Villagers arranged it. 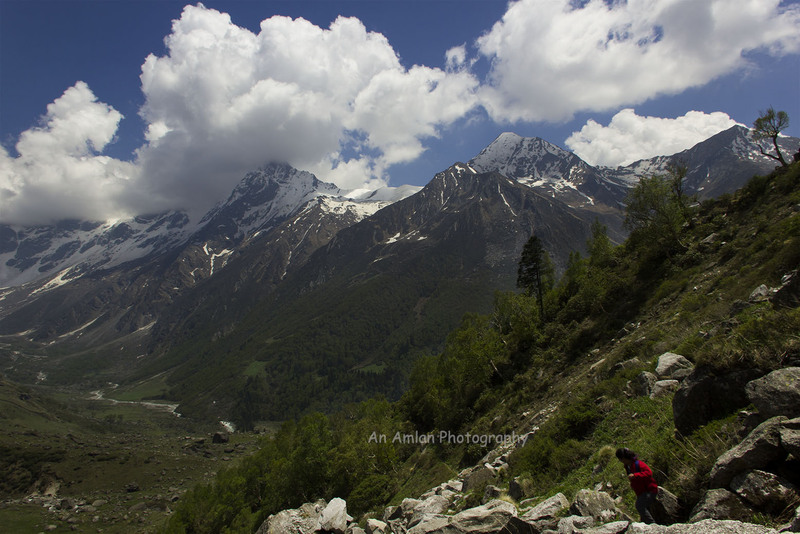 Mukesh and Ajit – Two young porters agreed to assist us. They were confident about the route, so we did not take any guide. We went to bed early as from next morning, our trek was to be started. As usual we started early. We follow this practice just to have ample time for photography in the soft morning light. It has another advantage – I am a slow walker so it keeps more room in hand to take rest during walk. It was a pleasant weather. 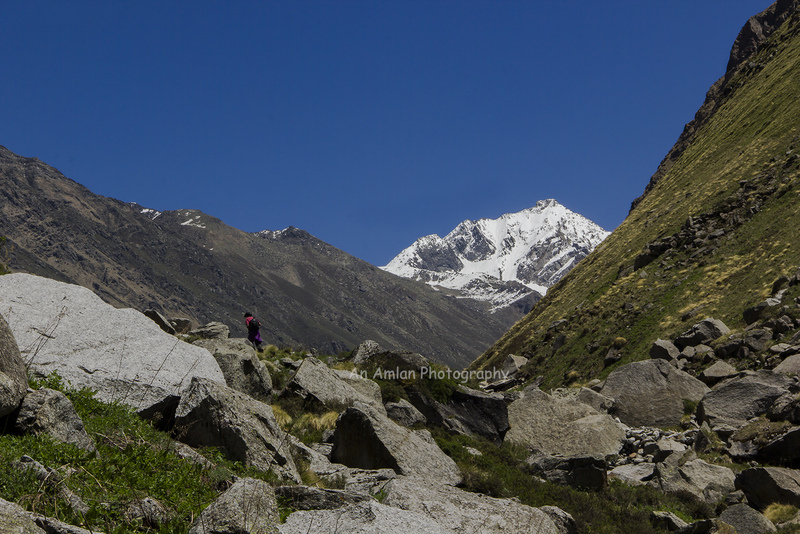 The trek started with a comfortable descent towards the bank of river Supin. Walking along sparkling, flowing, playful water of river Supin, we entered into wild. Fresh air was purifying our lungs and the shadow of pine, chestnut, deodar, sycamore was giving us energy for next few days. 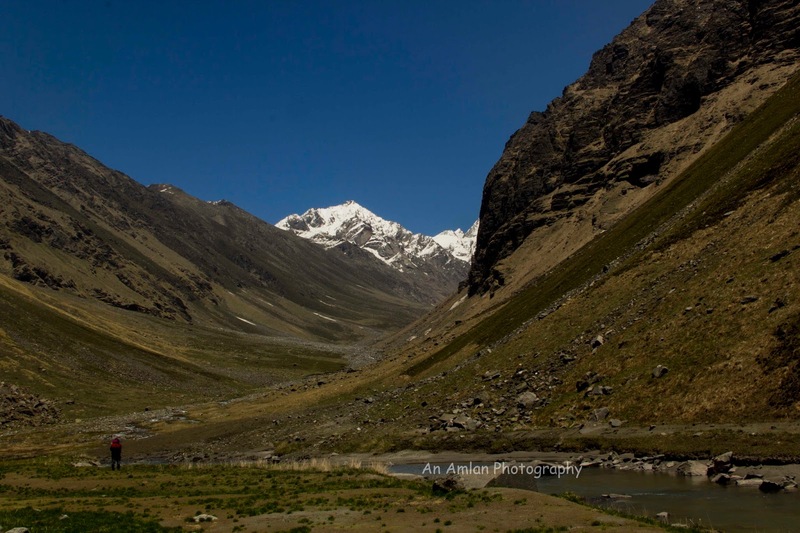 With a small ascends, we reached at Ton, which is the confluence of two rivers – Rupin and Ton. A seasonal snacks joint was settled there. Though we were not that much hungry but the smell of hot Maggie appetized us. After a plate of Maggie with a cup of coffee we resumed our walk. It was really an enjoyable trek with a bit up and down. After a certain distance, we saw a picturesque village named “Gangad”. The jovial villagers were so friendly that we spent more than an hour there. As usual we carried lots of chocolates for the kids. They were very happy and thus interacted with us cordially. We captured some good candid moments of them. Suddenly I saw, a little girl had jumped into Shipra Di’s lap and started reciting the famous rhyme “Twinkle twinkle little star”. I felt a stream of salty water on my cheeks. After Gangad, it was a small ascend. Suddenly Ajit said, “Saab, Seema aa gayi” (Sir, we have reached at Seema). Seema is a hamlet located on the bank of River Supin. We booked Taluka GMVN Bungalow from Kolkata. After checking in, we had a good lunch with chapati, dal, and a delicious curry of local vegetables. The village Seema has a twin village – Osla, which is just on the opposite bank of River Supin. An overhanging bridge connects these two sisters. Osla is the village that contains the only temple of Duryodhana in this world. The villain of The Mahabharata is worshipped here. This is strange!!! Instead of valorising the Pandavas of the Mahabharata, the people of the area worship the Kaurava prince Duryodhana. “We must watch the temple”, said by me. “How come? Look at the sky.” Avra Da replied. I looked up, “Oh my god!! !” Clouds were getting gathered. There was no question to cross the river by the bridge. We decided to see that temple during our return. Unfortunately, weather did not allow us even on the return day. We were talking with our young porters. By that time, we met a Bengali gentleman Mr. Raju Chakraborty, who had the plan to trek Har Ki Doon with his spouse and kid. Bengalis are known for their “Addabaji” (Chit-chatting). We showed respect to that phrase we had a wonderful adda with Rajuda & Co.
By that time, it was 9PM outside. Mukesh suggested us to have diner. We obeyed him and called it a day. Mukesh brought the bed tea with frown. It was so unnatural for a jolly boy like him Avra da asked “Kya hua Mukesh, sab kuch thik hai na? Tum itna chintit kyun ho?” (What happened Mukesh? Is everything okay?). “Nahi Saab, Bahar ayiye” (No Sir, please come out and see). We went to the balcony and found a small chunk of cloud in the northern sky. Apparently, it should give a pleasure to any photographer as it could form lovely cloudscapes but all of us knew that in the afternoon the cloud would cover the sky and it can be raining after 1 or 2PM. Keeping our fate to almighty we started early after having breakfast with bread and curry. Avra Da suggested us to walk with a pace so that we could cover as long as possible before rain. Initially it was a steep ascend right after crossing the overhanging bridge shown in the picture above. It gave us an elevation of at least 200 meters within 5-10 minutes. This climb ended with a bifurcation. One of the road led to the village Osla and another one was towards Har Ki Doon. Obviously, we took the second one and continued trekking through a beautiful grassy trail. While walking, we spotted a giant rock with the backdrop of Mt. Yellow Took and Mt. Black Peak (Mt. Kalnag). Huts of Seema village looked like match boxes from there. Walking after a few kilometres we found a snacks joint. The name of that place was Batgouri. It was a small seasonal dhaba run by a veteran couple. We kept trust on 2-minutes-noodles and continued our walk. After a certain distance, we reached at a small beautiful meadow. It was a green grassy land with land of mustard. The name of this romantic place was Kalkattidhar. It was an interesting point of the trek. 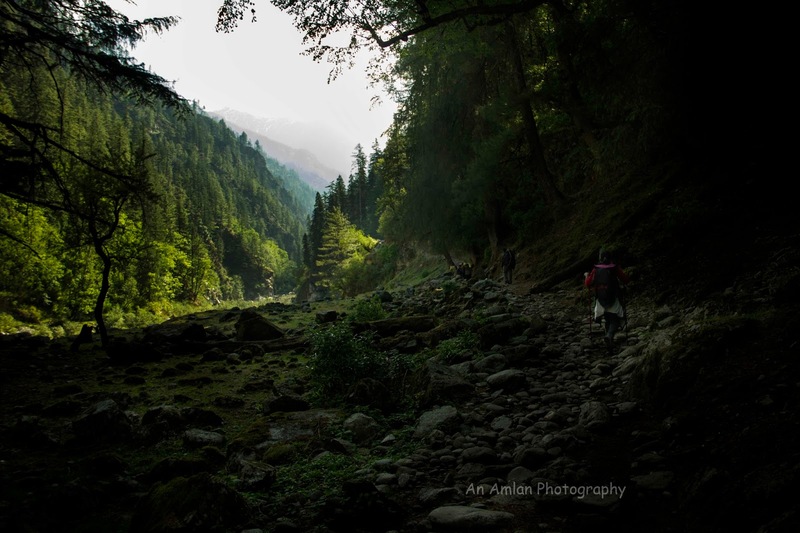 From there, the trek route took a right-angled turn towards left that resulted the sudden disappearance of the trail that we had left so far and we got the first glimpse of Har Ki Doon valley. Mount Yellow Tooth and Mount Kalnag were prominently visible from Kalkattidhar. Trail was a bit towards ascend from there and walking for an hour suddenly we heard the noise of waterfalls. Due to a recent landslide, the trail near the waterfalls was so sloppy that Ajit and Mukesh had to help us to pass a certain portion. We literally crawled. I never imagined that “Waterfalls” could be the name of a place. As there were two adjacent waterfalls, the local people named the place “Waterfalls”. There was a small Dhaba. We were not that much hungry but Mukesh suggested to have lunch as our destination was 8 kilometres away from that place and there was no food joint before that. Rice, Dal and vegetable curry served the duty of our lunch. The condition of weather was gradually deteriorating and when we started walking after lunch it started raining. We unpacked poncho and put it on. It was the toughest part of the trek. I suddenly found that my health was not permitting me to walk. More over though I was covered by poncho, the hands below the elbow was bare and the ice-cold rain drop was piercing my skins like needle. The trail was not only steep ascend but also got slippery due to the rain fall. Mukesh was with me and continuously boosted up. The fitness level of Avra Da and Shipra Di was higher than me. Walking through the rain for than two hours finally we reached at the bank of Har Ki Doon river. Har Ki Doon valley started from there. But the GMVN Bungalow was one killometer away from that place. We crossed the river through an unstable wooden bridge and sheltered at the bungalow. Right after reaching there Avra da and Raju da came and helped me to put off the poncho. I was so shattered that it was tough for me to change. Shipra di served hot tomato soup. With their help, somehow, I managed to go inside the room. Even without changing the dress, I managed to go inside the blanket. It was a blunder. I should not have done this as it made me sick and screwed me up. I could not go to Yamdaar Glacier. Last day’s sleep right after the trek made me weak and water intake was less. I waas looking so exhausted that Mukesh and Ajit forbid me to go the glacier. 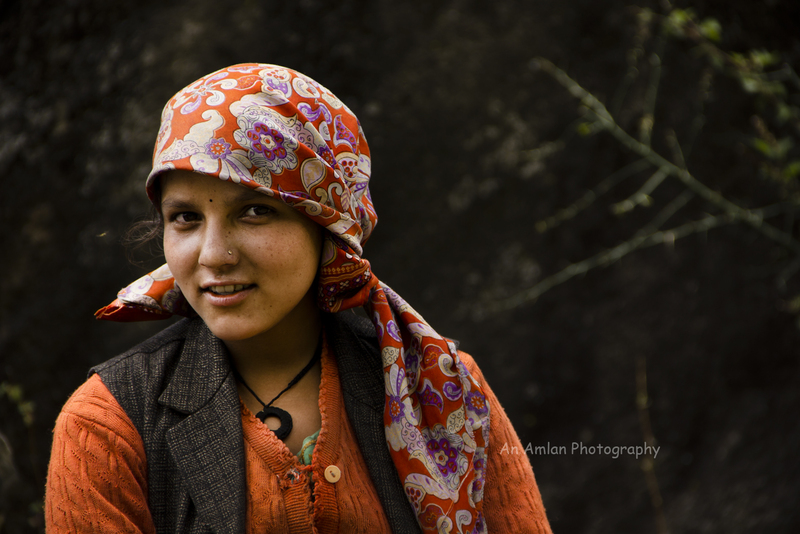 I roamed around the entire Har Ki Doon valley. My vocabulary is insufficient to express the beauty of Har Ki Doon valley. 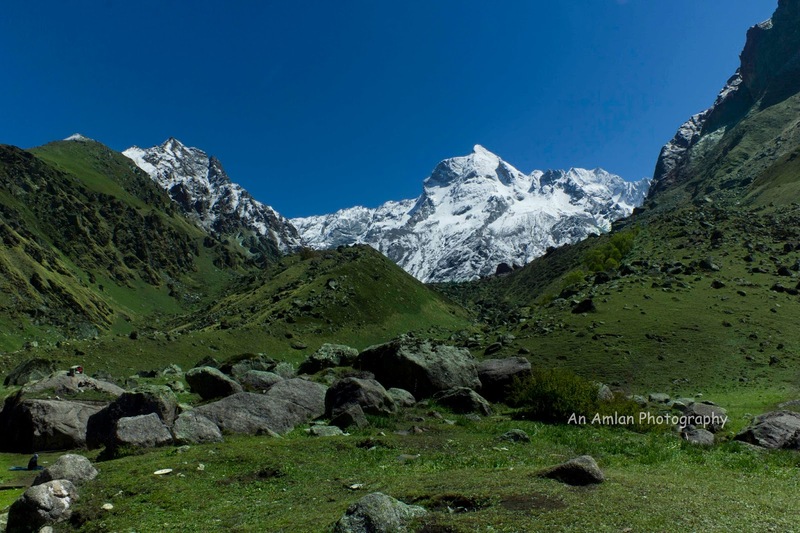 The valley is surrounded by Mount Atta, Mount Swargarohini, Har Ki Doon Peak and Borasu pass this heavenly valley is located on the bank of Har Ki Doon river. Mount Swargarohini is one of the beautiful peak that I had ever seen till date. The Sanskrit word Swargarohini means the ascending towards heaven. 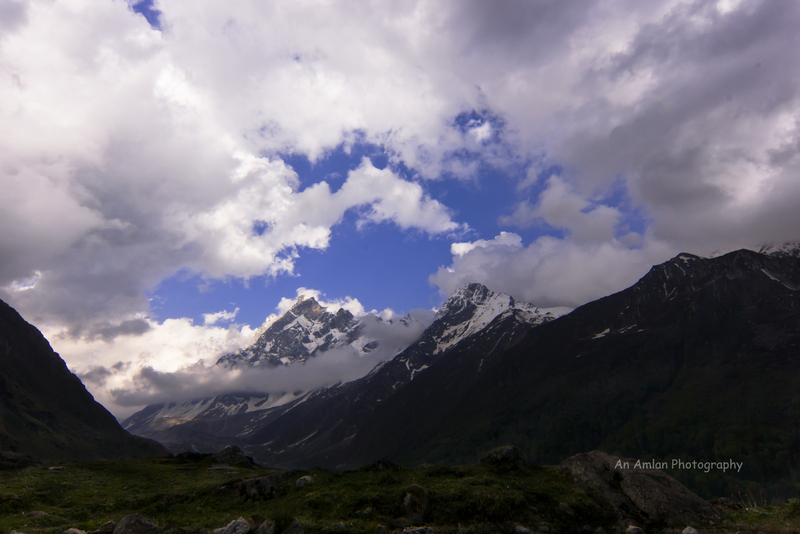 According to the epic Mahabharata, Yudhishthira, the eldest Pandava, traversed Mt. swargarohini on his way to heaven. 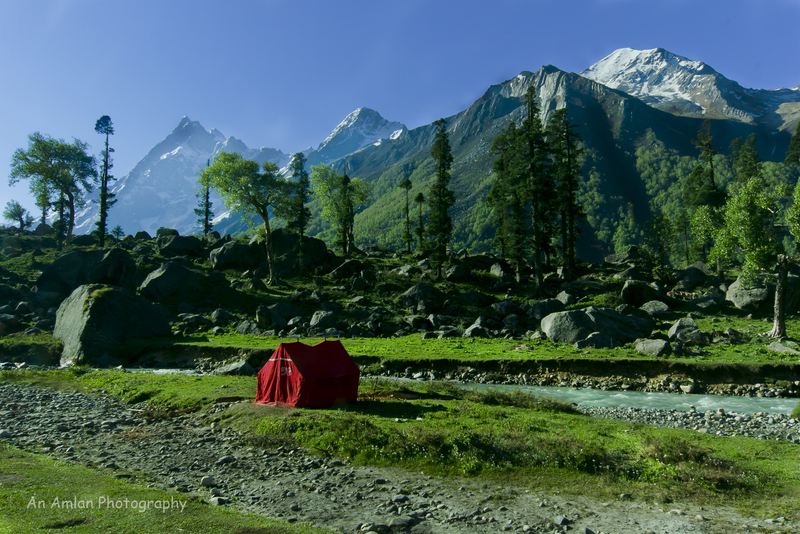 Camping is another option to stay in this valley. We found many people stayed there inside tents. 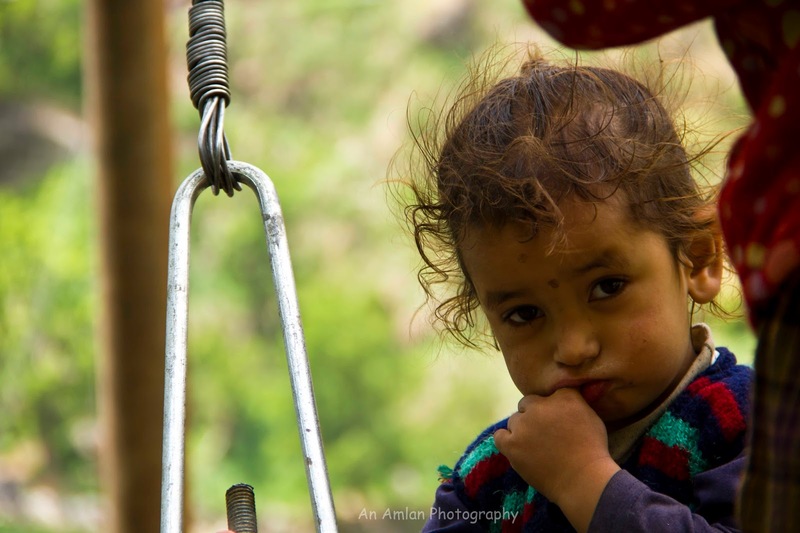 Avra da said, “If we come here again, then we will stay at camp”. Shipra di and myself agreed instantly. It was the bright sunny day and more over I got recovered from the fatigue. We went to Morinda Taal that was only 4 kilometres away from Har Ki Doon. Taal means lake. 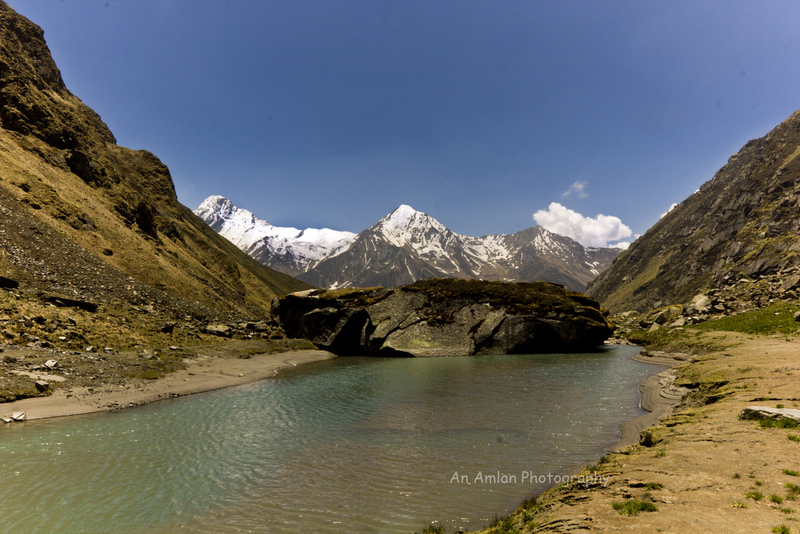 Morinda Taal is a small, beautiful lake from where Morinda Nala (canal) is originated and if anybody walks along the bank of Morinda Nala, s/he can reach to Borasu Pass, the pass that connects Tamasha valley of Garhwal Himalaya to Baspa Valley of Kinnaur Himalaya. 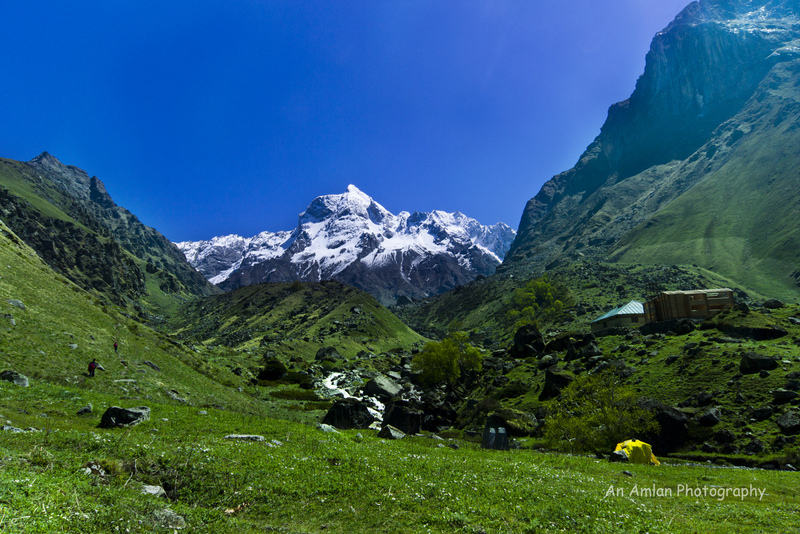 The color of the terrain is similar to that of the Kinnaur Valley of Himachal Pradesh. This is the rough and yellowish Himalaya that I like very much. The great Himalayan Mountain range is ascetic here. He is out of all materialistic desire. He is like a wise monk. 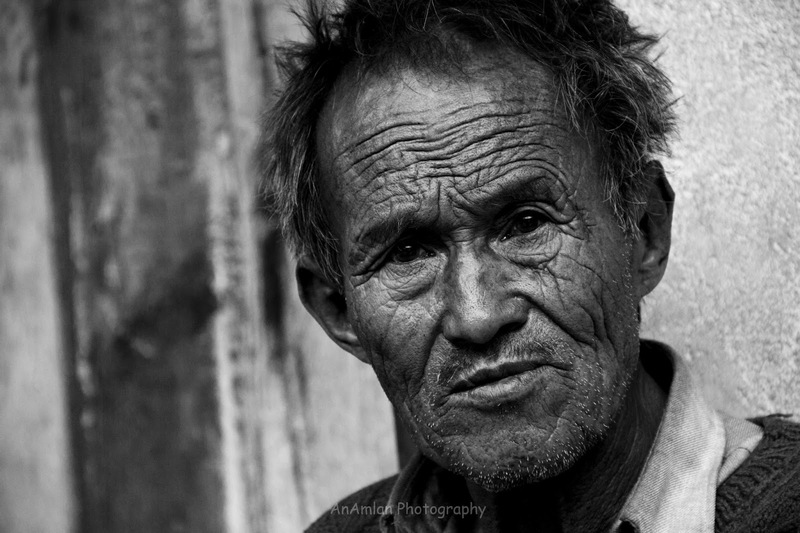 He has left all the glory of youth, sorcery of a young man no longer exists in him, but his veteran personality still appeals people to come towards him. 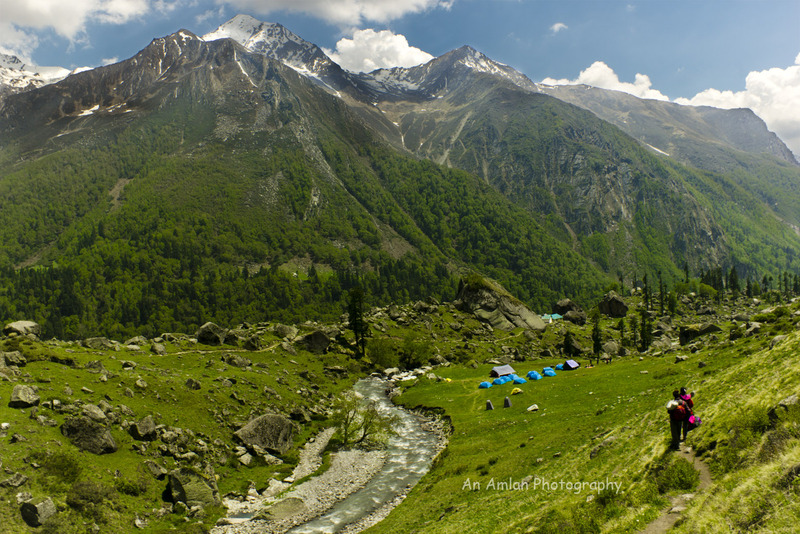 Mentally bowing down, we looked the beauty of valley until Mukesh and Ajit came to us and asked to go back to Har Ki Doon. We enjoyed one round of photography and started our journey for Seema. It was the same route that we crossed on second day. God kept some gifts for us in this day. 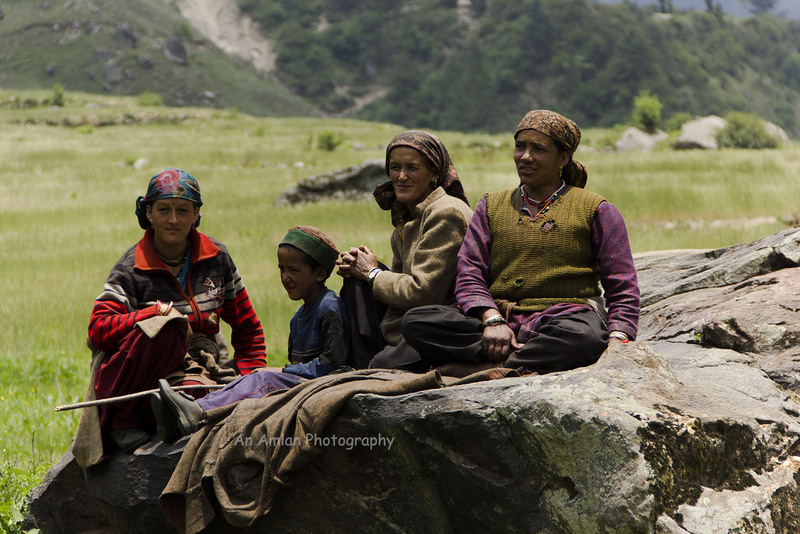 While we were on Batgouri meadow, we found a group of local people. The entire group was so jovial and friendly we really enjoyed their company. Specially I’d like to mention about an old lady. 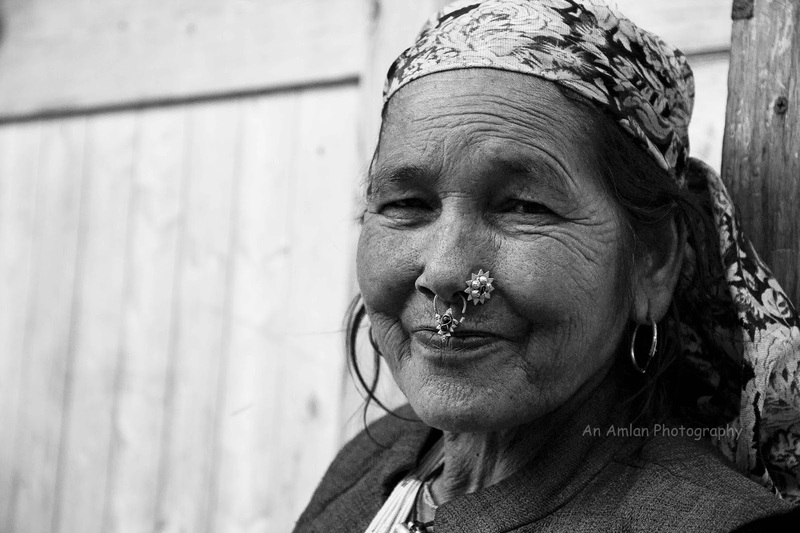 I was so surprised to see the beauty of an old lady. Her beauty is quite similar to Greeks. We had some quality time there. Walking along the grass land we met a young lady. She looked a bit upset. When we offered her chocolate suddenly she started interacting with us. Her relationship got broke up but so initially she was a bit disturbed but after sharing with us she got some relief. I loved her portrait and asked “will you be my model?”. She smiled back and agreed for it. It reminded me the song of Bob Dylan, “I met a young girl, she gave me rainbow”. We had a plan to go to Osla and see the Duryodhana Temple. But the weather condition did not allow us. We had lunch at GMVN Bungalow, enjoyed a lot by interacting with common people. 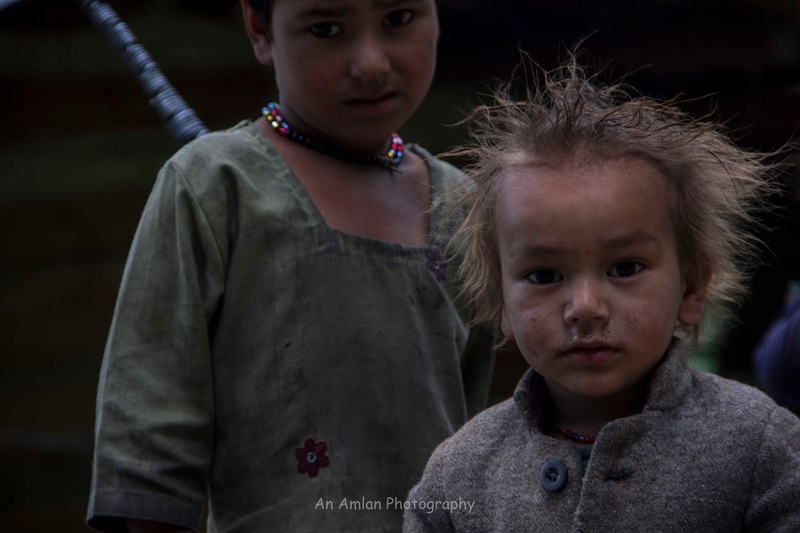 It was the last day of the trek. We started for Taluka at arond 9PM. The day started with a sad news – the demise of a young girl of Gangad village. We decided not to take any photograph in the trail. We reached Taluka by 2PM. We had a plan to stay at Taluka but suddenly Avra Da suggested to go to Sankri so that next day we can start early for Dehradun. His idea sounded good to us. So, we got a shared jeep and came back to Sankri. We did not have booking in Sankri but somehow, we managed to get a shelter there. Next morning, we got a cab and came back to Dehradun. From Dehradun we took a bus for Delhi and came back to plains. Please carry a photo identity proof if you are an Indian. For foreigners, passport is required. It is better to have at least two photo copies of the proof. GMVN Bungalows are good. But you can have your own tents for staying. 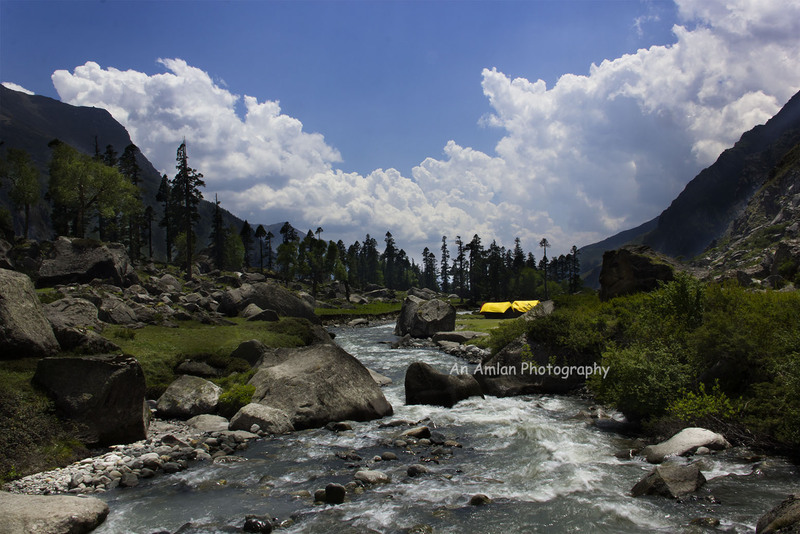 Har Ki Doon is a valley where camping will be a life time experience. Please take guide and porters. There are some bifurcations in the route. Please do not litter the trek routes. Love and respect mother nature. 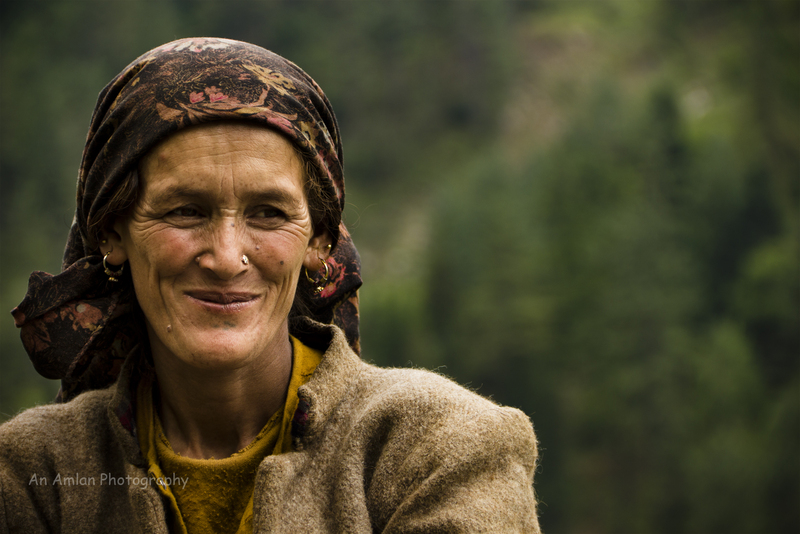 Interaction with local villagers will make your journey happier. But please show them due respect. They are honest, jovial and soft spoken. Beautifully written with good information and excellent pictures. Waoooo lovely place. I like to visit once. Thank you Sona dada. Outstanding photography.. Thanks for sharing such amazing shots with us.